Mabel from MabelKwong.com very kindly agreed to star in this week’s special edition of My Monday Meals. Mabel lives in Australia and her blog is full of really interesting articles about, Asian Australian, multiculturalism and diversity. I chose Mabel as my first guest post for several reasons. We like many of the same foods, we share similar views about Asian dishes but also because I am a bit nosy. I love to know what others eat in a day and how it may vary according to where you live. Australia seemed like a good place to start seeing as I have never been. Here is Mabel’s Monday Meals (I love alliteration!) with an introduction in her own words to give you a bit of background on her dietary needs and preferences. I hope you enjoy this food diary as much as I did. I’m picky when it comes to food. Sometimes I blame my taste buds and personality: if I don’t like what I eat, chances are stubborn me won’t finish that dish and eat it again. On a sombre note, I get reflux and stomach ulcers easily. To keep my stomach happy, my doctor advised me to avoid chilli, tomato, caffeine and alcohol. So my diet is limited. Most days I eat plain, non-strong-spiced foods. That doesn’t mean my meals can’t taste good. Here’s a rundown of what I ate today, all of which I enjoyed and my stomach approved. 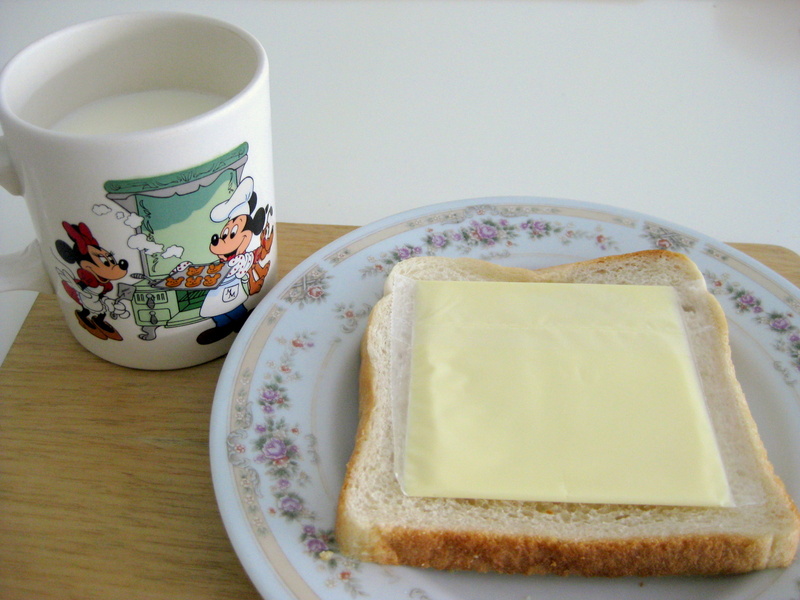 A piece of white bread with a slice of cheese and a warm cup of full cream milk. The usual. Normally I have wholemeal bread but this week my brother wanted to make sandwiches and he doesn’t like this type of bread. So my mum ended up buying a white loaf from our supermarket for the household. A lot of my friends balk at my small breakfasts. But I really only have to swallow a few mouthfuls of food before I feel full in the mornings. I picked up one Triple Spring Onion and one Chicken and Potato bun from Breadtop, a bakery selling all things bread and baked, sweet and savoury. 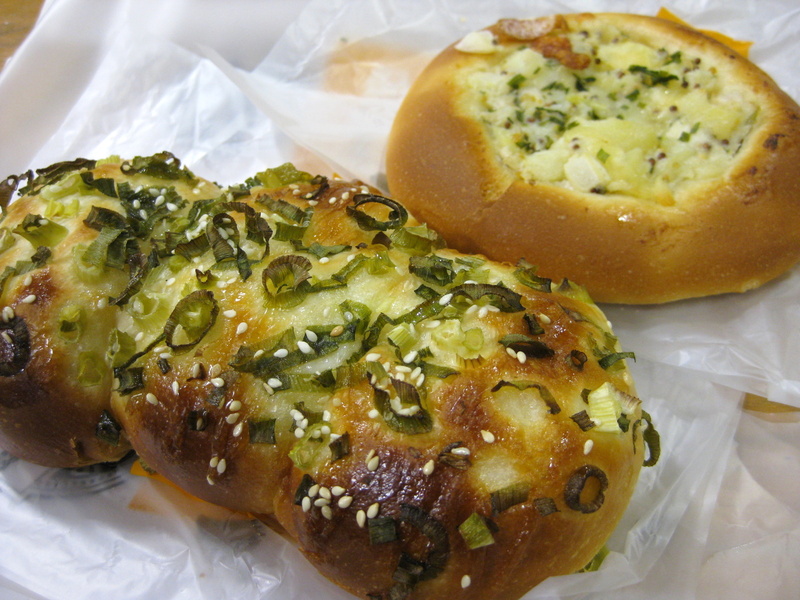 The first bun was laden with green onions – no, they didn’t make me cry – and Japanese mayonnaise. I could taste some of this mayonnaise in the second bun, which was also accompanied by generous helpings of potato and a dash of chicken, parsley and cheddar cheese. 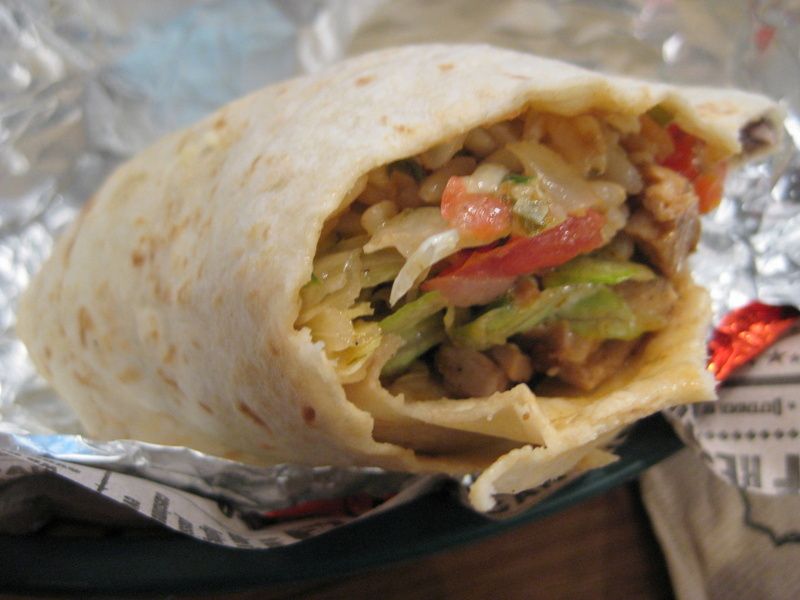 A chicken burrito with mild tomatillo salsa from Mad Mex. I accidentally said yes to tomato when ordering my burrito. Luckily I was able to pry the tomato chunks from the burrito with my hands as I was chowing it down. Brown rice, lettuce, black beans, sour cream and cheddar cheese were squashed into the pita wrap. This burrito was not salty and although I got a small one, it came with a large serving of rice. And the mild salsa was very mild. As I did some writing (and this post!) 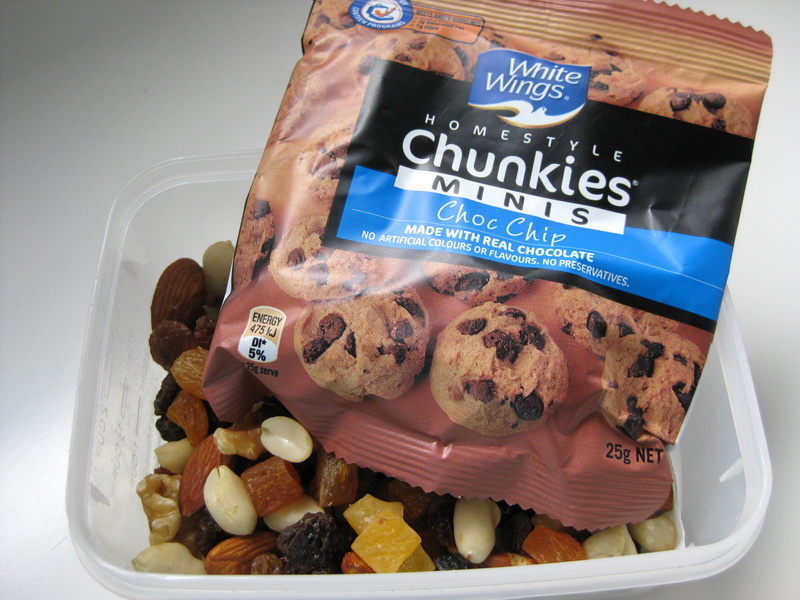 at night, I grazed on mixed nuts, raisins, sultanas and dried fruit. A pack of very crunchy mini chocolate chip and coconut cookies also (distractedly) kept me company as I crafted words. I also had a 250ml can of Pepsi which I really shouldn’t have had as it contains caffeine but I suppose once in a while its okay. Don’t forget to check out Mabel’s website and more of My Monday Meals.